I was too young to have tried to go to the famous Studio 54 disco club in New York City in the 1970's, where Andy Warhol was one of the regulars. This is a combination of glass engraving as well as sand blasting glass. The figure of Andy is hand engraved onto one glass panel and the image of the raincoat and hood is sand blasted on glass using a micro sand blaster. 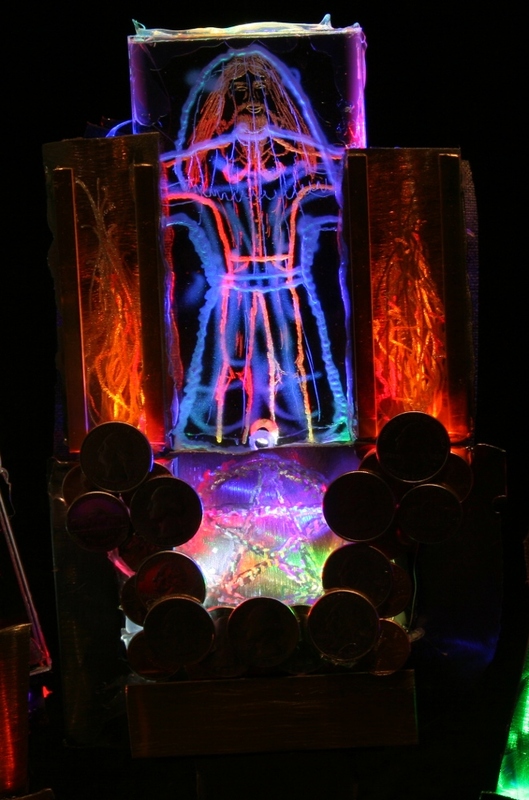 The two layers of glass are each lit with different color LEDs shining into the bottom edge. The steel panel at the bottom is lit with multicolor LEDs and has a carving of the penticle was free-hand done using a carbide engraving tool.